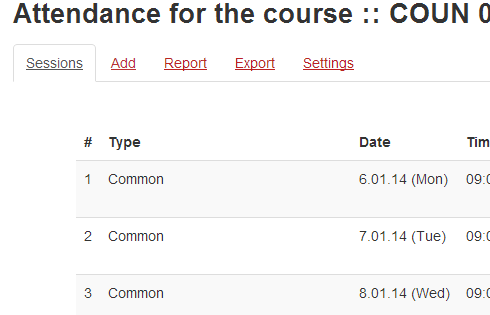 Step 1: On your course page, click the link to the attendance activity (not the Update icon). The activity will open. Step 2: Click the Sessions tab. The Sessions screen will open. Step 4: Click the green circle to open an unrecorded session, or click the green back-arrow to edit a session with existing marks. The Attendance screen will open. 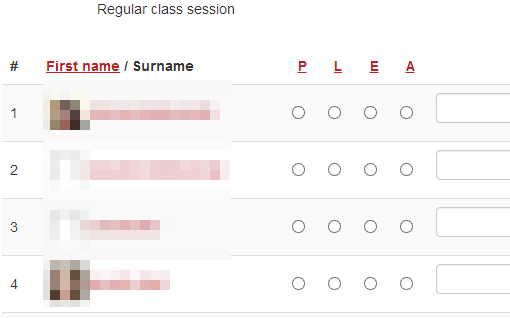 Note: If you leave the Sessions screen and return, you may need to click All or All past (top right) to see past sessions. Step 6: To record notes for particular students, type in the Remarks column. Note: Both you and the student for whom you record a message will be able to view remarks. Step 7: Once finished, click Save attendance (at bottom) to save your work. You will see a confirmation that "attendance has been successfully taken," and then the Sessions screen will open again.